Canadian officials are welcoming the wave of migrants from the United States who are seeking to escape President Donald Trump’s popular enforcement of the nation’s immigration laws. So far this year, more than 35,000 asylum seekers have landed in the country, up from 24,000 in the same period in 2016. The summer surge forced officials to house asylum seekers at Montreal’s Olympic Stadium and other temporary locations. While the numbers have since receded and the stadium site was closed, border officials recently installed heated trailers at the border in anticipation of continued crossings during the winter. Of the 13,000 refugee claims filed so far this year by asylum seekers, only 300 had been processed by last month. Half of these asylum seekers were granted refugee status. While they await their hearings, asylum seekers are granted work permits and have access to health care. Canadian officials told the Washington Post that they expect more U.S.-based migrants to seek homes in Canada because U.S. officials are promising to enforce the temporary residency rules within the huge “Temporary Protected Status” program. Under that program, the United State has hosted almost 400,000 people from Haiti, Honduras, El Salvador and various other countries. The migrants’ 18-month stays have repeatedly been extended since 1999 by officials working for President George W. Bush and Barack Obama, but are now being wrapped up by Trump’s deputies. By the end of November, DHS must decide whether to extend TPS for 50,000 Haitians. They were given TPS because of a huge earthquake that killed 200,000 people in 2010. In early January, the DHS must also decide whether to extend TPS status for 200,000 people from El Salvador, who were permitted to stay in 2001 after their country was hit by earthquakes. Also, from 60,000 to 90,000 Hondurans living in the United States will learn in May if their residency permit will or will not be extended. Canada’s welcome also simplifies U.S. politics, partly because Democrats oppose the repatriation of migrants back to their home countries. Many of the TPS holders who have been already invited to go home have instead decided to accept Canada’s welcome, which includes healthcare and work-permits while their asylum pleas are considered. Canada is a promising location for migrants, partly because the nation’s Somali-born immigration minister has announced plans to increase the nation’s immigration inflow to one million people every three years. Many migrants are journeying up to the Candian border to ask for asylum as refugees. The processing system is slow but has been successful for half the migrants, according to the Washington Post. Moreover, rejected migrants may get multiple bites at the apple because their relatives can apply for asylum, and if successful, can later bring in the previously rejected migrants via Canda’s form of chain-migration. The Washington Post noted that Canadian officials suggest they do not want a wave of migrants to reach their border. Canada has an increasingly diverse population, with visible minorities making up 22.3 percent of the population in 2016, according to recently released census figures, compared with 4.7 percent in 1981. By 2036, visible minorities are expected to make up 33 percent of the population. 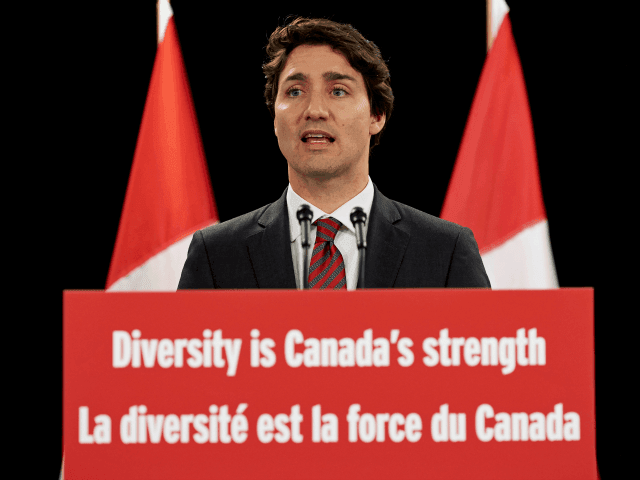 Canadian Prime Minister Justin Trudeau is a champion of multiculturalism and declares that ‘diversity is strength.’ His party won 184 seats in the parliament in the country’s most recent elections.